Despite being legally blind, Staci Mannella has no fear of skiing down the side of a mountain. That I-can-do-anything attitude has enabled Staci Mannella to ski fearlessly since she was a little girl. No hills were too steep; no turns were too sharp. Stacy shied away from none of it. She was blind to her disability. And why wouldn’t she be? She had a magical routine. She insulated herself in gear that cut bone-chilling winds. Fastened her boots. Goggled her face. And the world was at her ski-gloved finger tips. Enter long-time ski coach Kim Seevers. That was seven years ago. Mannella and Seevers teamed up in 2008 and tackled the most daunting of hills together thereafter. Mannella’s fearlessness amalgamated with Seevers’ experience avalanched into thousands of competitive runs. Then in February of 2014, the athletic-packed combo journeyed across the world and found themselves in Sochi, Russia. To appreciate them, you have to understand the odds against them. Mannella’s best corrective vision is 20/800. She doesn’t have cones in her eyes, so she is also colorblind. She has terrible acuity in bright light (like sun or snow) which further hampers her sight while skiing. She recently became the owner of a guide dog (to help her at college), and she’ll never drive a car. Seevers is 39 years older than Mannella. She had to ski in front of the fearless, blind teenager. Chart hill courses for her. Judge terrain. Race the course herself—and all in her talented yet 50-year old physique. Despite all the challenges, Mannella managed to accomplish one of her greatest dreams at a mere 17 years old. She is a paralympian, and so is her 57-year old guide, Kim Seevers. That’s putting it mildly. They skied in six national championships, multiple North American Cups, three world cup series—winning their first world cup race in New Zealand in the summer of 2013—and finally in the Paralympics games in Sochi, Russia. Seevers recognized Mannella’s talent early. “I told her parents the first night we agreed to race together that she could compete in the Paralympics Games,” she said. Mannella was only 11 years old at the time. Seevers was a full-time grant writer and part-time ski coach for the Adaptive Sports Foundation. Mannella had been skiing with the foundation since she was four years old. “She kind of found me,” Mannella said. “She saw some potential in me.” But Seevers knew taking Mannella to a world-class level was going to take every ounce of energy both of them could muster, yet she was ready for the challenge. So the drill began: pack, travel, eat, sleep, ski. It was all they knew. Oh wait, that’s not exactly correct. Mannella was a full time student and Seevers was a full time grant writer—something you won’t find mentioned in the Sochi chronicles. They were the only working class pair in the entire elite pack. They fit work and school in while crossing time zones like we cross streets. ”We were on skis around 175 days between July 2013 and April 2014,” Seevers said. Their efforts put them elbow to elbow with the best women in the world. “It was the first time we’d seen them in person and not just on the rankings list,” Seevers said of that time. When they realized they could compete with the best, their efforts heightened. They went to training camps with national team coaches and raced all across North America. “Sochi was the culmination of every single thing we’ve done since we started skiing together,” Seevers said. In Sochi, the duo had to memorize the number and order of the gates on the course and communicate through Bluetooth microphones in their helmets while skiing. Mannella could only see the back of Seever’s Jacket. Seevers had the tough job of relaying crucial information to Mannella during each run while maneuvering the hills herself. It wasn’t just about skiing for Seevers. Only this time it was different. This time she was at Sochi. “I was racing the course too,” she said. ”I couldn’t make any mistakes or Staci would be disqualified.” Despite her concerns, Mannella and Seevers came away with nearly flawless runs. 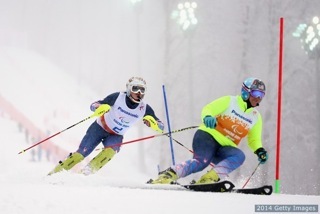 They earned two sixth place awards at the Paralympics—one at the slalom and another at the giant slalom events. 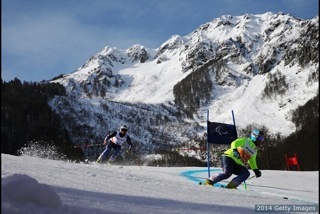 Seevers had guided Mannella down the side of a Sochi mountain and into alpine stardom. In 2014, Seevers and Mannella ended their six year run together. 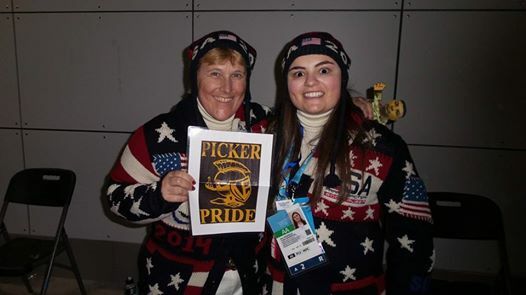 At 57 years old, Seevers retired her coaching hat but not without earning the respect of the entire American Ski Community. “I respect her for everything she has done to make me the most successful athlete possible,” Mannella said. “It’s been a fun ride.” And while Seevers may be stepping off to the side, she’ll still be one of Manella’s biggest cheerleaders. And Mannella’s I-can-do-anything attitude still lives on. “Now I know what to expect and I have four years to make it happen in Korea,” she said. “Look for Staci in 2018,” Seevers said with the confidence of a skier, coach, guide, and real Athletchic. Listen to more about Seevers and Mannella’s story by clicking here! Cyndie Zahner works as a public sector grant administrator and a freelance writer. Past publications include health, fitness, women’s issues and personal interest stories. Zahner has completed marathons, triathlons, and adventure races. Her favorite athletic accomplishment was crossing the finish line of the 2013 Baltimore Marathon holding hands with her daughter Jessie Zahner and her best running buddy of 25 years, Robin Smith. A close second was qualifying for the Boston Marathon at the Boston Marathon. Follow Cyndie on Twitter at @TweetyZ.